Supriya D. Mahajan, Wing-Cheung Law , Ravikumar Aalinkeel, Jessica Reynolds, Bindukumar B Nair, Ken-Tye Yong, Indrajit Roy, Paras N. Prasad and Stanley A. Schwartz. 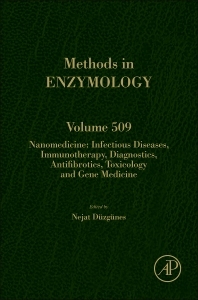 This volume in the Methods in Enzymology series comprehensively covers Infectious Diseases, Immunotheraphy, Gene Medicine, Diagnostics and Toxicology of Nanomedicine. With an international board of authors, this volume is split into sections that cover subjects such as Nanomedicines in Immunotherapy, Nanomedicine toxicity, and Diagnostic Nanomedicine. University of The Pacific School of Dentistry, San Francisco, California, U.S.A.